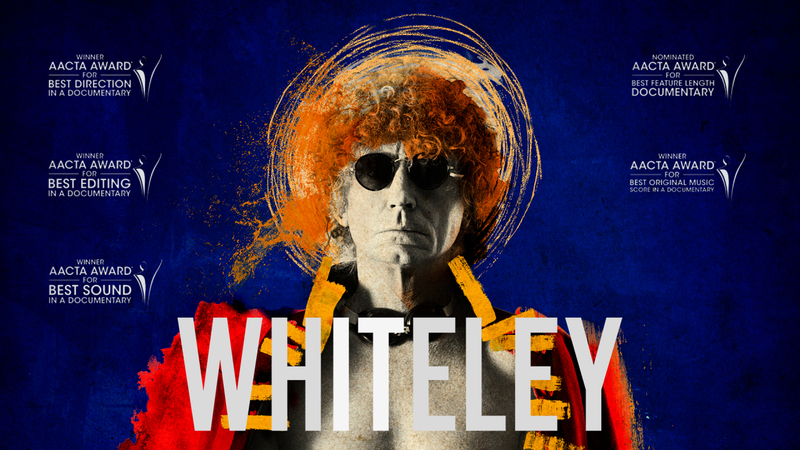 Brett Whiteley is an Australian cultural icon. His brief, dazzling career was as combustible as it was stellar. Only now, 25 years after the artist's untimely death, is his impact on the international art landscape being understood. A visual journey into the private life and creative legacy of Australia’s most acclaimed artist, Whitely offers a deeply personal tour through the mind of a pioneering artistic visionary. “We were an average to extraordinary Australian middle-class family, into which God saw fit to throw a hand grenade.” From an early age Frannie Whiteley knew that her brother was extraordinary. Indeed, the conservative confines of post-war suburban Sydney couldn’t contain Brett Whiteley for long; at the age of just twenty, he embarked on a journey of artistic and personal self-discovery that would see him flower in Italy, flourish in London and self-destruct in New York, before returning to the land of his birth firmly established as one of the greatest artists of his generation. Despite shifting surroundings and several artistic reinventions, Whiteley always lived according to the mantra that life, love and art are inseparable. “As a small child, I'd hold up paintings to my parents to get some approval. I thought that every time I did a drawing, if I was lucky, I would receive a piece of love.” Whiteley’s immersive approach to his work fuelled his creativity, but also gave him a unique capacity for destruction. His wife and muse Wendy knew this better than most; the inspiration for some of his most creative episodes, she was simultaneously a witness to their devastating impact on the artist's life and on those closest to him. In New York, she watched as Whiteley, consumed by the painting of his ‘American Dream’, descended, “into a kind of like unbelievable state with alcohol”. On one particularly bad day she found him “unconscious on the floor, lying kind of in front of the painting, that centre panels of the American Dream which really looked like they’d been vomited up onto the canvas, in a pool of vomit himself”. Sue Clothier is recognised as one of Australia’s leading factual production executives and creative producers. In a career spanning more than two decades in the entertainment industry, Sue has produced or overseen the production of hundreds of hours of original broadcast programming. Sue’s career highlights include the feature docu-drama directed by Gillian Armstrong, Unfolding Florence: The Many Lives of Florence Broadhurst; Australia’s only official selection at the 2006 Sundance Film Festival, the Logie-nominated drama-doc series Darwin's Brave New World, the Walkley-awarded Cronulla Riots: 10 Days That Shocked The Nation and the Emmy nominated Life On The Reef. James Bogle has co-written and directed four feature films, Closed For Winter (2009), In The Winter Dark (1999), Mad Bomber In Love (1993) and Stones Of Death (1989) and is in development on his fifth, based on the award-winning novel 'Strange Objects' by Australian writer Gary Crew. James served as a board member at Western Australia’s state film funding body, ScreenWest from 2001-4, and as an Executive Committee Member for the Western Australian Branch of the Australian Directors Guild from 2010-12. James also directs television commercials, teaches tertiary film studies and works as an industry consultant and script editor with a special interest in the development of young and indigenous filmmakers. Since graduating from AFTRS in 1986, Victor Gentile has worked as a producer, writer and script developer on projects ranging from short films to documentaries, children’s drama, telemovies and feature films. As an independent producer and overseen some dozen television documentary projects including the ABC's Faces Of War series, Megan Simpson Huberman's War Of Distance, Centotaph by Chris Tuckfield, David Caesar’s Convictions, and The Golden Pig for SBS. He was a founding director of the film production company, Oracle Pictures, and the sound post-production studio, Counterpoint Sound, and was Project Development Manager at Western Australia's screen funding and development agency, ScreenWest. In recent years, Victor has written on children’s TV series such as Streetsmartz, Parallax and Stormworld for Western Australian producer Paul Barron as well as for Electric Pictures developing, researching and writing various TV documentary projects from concept to production. Every piece of the dialogue in the film is authentic – either captured on the archival footage our researchers discovered in all kinds of places, or recreated from notebooks and interviews by our actors who play Brett and Wendy with such perception. The private perspective is so important to this film: the moments of triumph, confusion, achievement and destruction; the intimacy of family moments, the note book entries about personal issues like fear, drugs, anger, rejection, paranoia. Our archival footage spans over four decades. 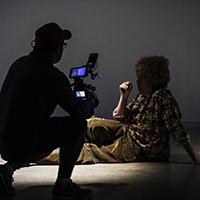 We’ve become so used to the images of a middle-aged Brett with his halo of red curls and creased face, that it is startling to see and hear the short-haired and intense 20 year old Brett, already on a fast track to art acclamation. Amongst the discoveries in the rushes tins from a 60 Minutes profile from the 1983 is a moving and intimate moment when Brett’s art hero, Lloyd Rees, speaks to him about technique. There is another unforgettable moment on film with the young Whiteley family, including baby daughter Arkie, lazing in the sun at Whale Beach after their return from London.